There has been a massive increase of refugees from Central America seeking asylum in the U.S., many of them unaccompanied children. So far this year the Border Patrol says that over 50,000 such children have crossed the border with Mexico, double the number for all of 2013 and five times that of 2009. Those grabbed by the authorities have been subjected to widespread and systematic brutal treatment, according to a lawsuit filed by the American Civil Liberties Union and immigrant rights organizations. “Children are being abused on a massive and widespread scale,” said James Lyall, a border litigation lawyer for the ACLU in Arizona. The ACLU describes children and teenagers being shackled in stress positions, kicked, yelled at, forced to drink from toilets, and denied food and medical care. These youngsters have been held by the government for prolonged periods in crowded, unsafe and freezing cold detention cells. The Washington Post posted videos showing makeshift holding areas at the McAllen, Texas Border Patrol station. The videos show dozens of women and children sprawled on concrete floors, in the cold without blankets. Refugee children are being housed in freezing detention centers with nothing but these tiny blankets for warmth. A 13-year-old boy picked up near Brownsville, Texas, said that a Border Patrol agent set his service dog on him, then denied him medical treatment for his bloody facial wounds and impaired vision from the attack, according to the ACLU. A 16-year-old girl traveling with her two-year-old son was put in a cold holding cell, jammed in with 30 others. After three days, she noticed that her son was feverish, and was given a wet towel, but denied any further medical attention. About a quarter of the minors that the ACLU interviewed, aged from 5 to 17 years, reported they were physically abused. Half said they were verbally abused and denied medical care, including a child whose asthma medication was taken from her even as she suffered multiple attacks. Shaken by the publicity of these terrible conditions, Obama declared that the situation amounted to a “humanitarian crisis.” But what is his solution? To step up the process of deporting these children, much to the dismay of immigration activists and many in the Latino community. This proposal fits in with the fact that Obama has deported more people than any other president, earning him the sobriquet of “Deporter in Chief” from young undocumented activists. To understand Obama’s proposal, it is necessary to see why these refugees from Central America – mainly Guatemala, Honduras, and El Salvador – fall into a legal category different from immigrants from Mexico. 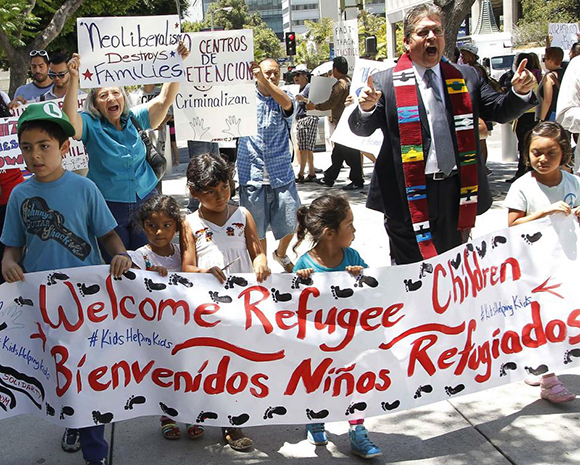 Refugees from Mexico are deported immediately back under the law. But refugees from countries not bordering the U.S. fall under a different law, which stipulates that they must be processed in a court to determine if they will be given asylum. Obama has sent to Congress a proposal for $3.8 billion to deal with the crisis. About half would be spent on opening facilities that could house the refugees in more humane conditions while their cases are being processed. The rest would go to hiring more judges, and increased forces on the border. Some Republican politicians – stone cold open racists — are complaining about the money that would be spent on minimally improving the conditions of the refugees’ imprisonment. The refugees are not allowed any legal representation in these courts. So a child of five or ten can be brought into a court to defend herself with no understanding what is going on. The White House states unequivocally that virtually all these refugees, including the children, will be found not suitable for asylum, and will be deported. This makes the “judicial process” a farce, as the certain outcome has been decided in advance. The trip these refugees make to get to the U.S. border across Mexico is arduous and dangerous. Gangsters called “coyotes” charge huge sums to ferry the refugees across the Mexican desert, and abuse them. Women and girls are raped. Some die from lack of food or water. What drives these people into the extreme desperation to even contemplate such a journey? Extreme poverty and violence. And these conditions are created by U.S. imperialist exploitation and policies. Workers and peasants in Central America and Mexico have born the brunt of the adverse effects of the North American Free Trade Agreement (NAFTA), which further opened these countries to imperialist exploitation and penetration – “free trade” in capital and goods, but not in labor power. One example among many has been the effect on peasants in these countries growing the staple, corn (maize). U.S. capitalist farms grow corn much more cheaply than the peasants could. The result over the years since NAFTA was implemented in 1994 has been the flooding of these markets by cheap U.S. corn, impoverishing millions of peasants, driving them into the already overcrowded cities, and adding to the chronic unemployment. Then there has been the disaster in these countries caused by the Great Recession and its aftermath. While workers in the advanced capitalist countries have suffered greatly in this period, when the imperialist center experiences economic crisis and stagnation, this spills over into even worse conditions in the oppressed countries, on top of their “normal” over-exploitation. The other factor in the increase in people seeking refuge has been the upsurge in violence related to organized crime. Much of this, too, has its origin in the U.S. – the “war on drugs” which is really a war to keep drugs illegal and the source of super-profits. “Organized crime” refers in effect to capitalist enterprises dealing in services or goods declared “illegal.” Since these enterprises are outside the law (although the law enforcement agencies are deeply intertwined with them, which explains their continued flourishing), they are armed. Their inter-capitalist competition is regulated by their gunmen. These cartels have grown so large in Mexico and Central America that they operate with virtual impunity. Honduras, for example, has become the murder capital of the world. The resulting violence terrifies parents and children, and many seek to flee. It is a side business of these cartels to dispatch the “coyotes” to further prey on those seeking asylum. Some of the current children refugees have parents who have already come to the U.S., with or without documents, to rejoin them. These parents work in the hardest and most dangerous jobs. They send much of their meager earnings back to relatives in their home countries. I have friends who work in these low paying jobs in the U.S., who have told me of terrifying instances where their relatives are robbed of these remittances at gunpoint right at the banks where they receive them. This current crisis with so many unaccompanied children refugees underscores the broader catastrophe of U.S. immigration policy. The immediate need is to grant all of these children asylum now! This would be a first step toward the reforms we really need in the U.S. immigration system: to grant the immigrants who want it citizenship, to make the borders as open to people as they already are to capital, a step toward a world without borders at all. 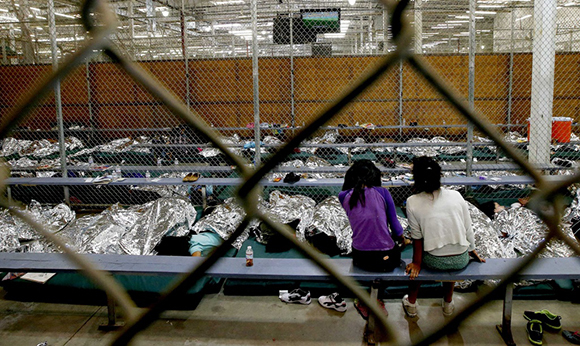 Conversely, to do what both capitalist parties propose–to deport these children–is a crime against humanity.